I was having some problems with my hands. A tendon in one of my fingers tore, and I had been knitting enough that my hands hurt. So, I tried these. I expected them to be stiff, but they felt as stiff as the metal needles I had been using. I didn't think they'd help, but I used them anyway, and the difference for my hands was amazing! These are so much easier on my hands, I can't believe it! The edges between the metal parts and the carbon shaft isn't smooth, and always seems to be a rough spot to get the stitches past, and that would usually make me not use the needles. But the benefit to my hands is enough that I'll use them anyway. The best sock needle yet! Light and sharp with the slightest grip on the carbon fiber shaft. The best needle I have used for sock knitting - trust me I have tried nearly everything out there, too. You have to give this needle a try. You will not be sorry. These are the very best knitting needles for socks. I have tried so many different brands and types of knitting needles and these are by far the best. Some were too slippery, bamboo broke, others caused the yarn to "catch" or "hang up" between the needle and the cable, and others had too much grip on the yarn. I love the very slight grip of the carbon fiber and the nice, sharp tips with these. They are so light it almost feels like you are kitting with air. I am more than pleased with these wonderful needles. Finally a great sock knitting needle!! 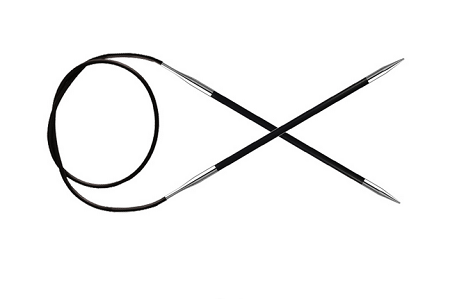 Q: Do the knitters Pride karbonz fixed circular knitting needles come in a longer length than 40" ? Q: What is the length of the needle? Thank you.